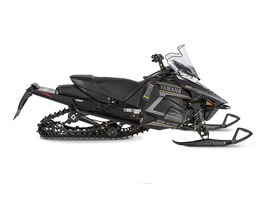 2016 Yamaha SRViper L-TX DX, 2016 Yamaha SRViper L-TX DX The master of every trail everyday. Features may include: Tuner 2 Skis Our Deep Keel Tuner 2 Skis are engineered specifically for the SRV Chassis and the unique characteristics of the Viper. They deliver reduced ski-pressure and near effortless steering; and the dual keel design delivers an assured bite in the corners with reduced darting. The design also allows you to customize the handling and feel of your sled with easy to change carbide runners in a variety of insert lengths for the inner and outer keel. HPG Coil-Over Front Shocks High Pressure Gas (HPG) shocks with strong 40mm bodies are calibrated to deliver consistent performance and comfort with excellent fade resistance. Plus the shocks are rebuildable, ensuring you season after season of consistent performance with proper maintenance. Heated Trail Seat A standard heated seat provides the ultimate in warmth and comfort on even the coldest of winter days. A simple flip of the dash-mounted switch allows you to choose from two settings of warmth allowing you to explore what lies beyond that next curve from sun-up to sundown in complete comfort. Standard Rear Storage A tunnel mounted, molded storage bag provides you the added convenience of easy access storage. The bag features additional padding to protect cargo, and an easy to open large zipper pull with weatherproof zipper. There s room for spare gloves, water, snacks and more. Standard Tall Windshield Escape the wind and winter s chill with a sculpted and contoured standard tall windshield. A small lip at the top deflects wind and snow up and over the rider, while flared edges provided added protection and warmth for your hands. Genesis 1049cc High Performance Engine The 3-cylinder Genesis engine has been regarded as the industry s best four-stroke engine. Featuring a sophisticated closed-loop fuel injection system and 4-valves per cylinder, the 1049 engine delivers a class-leading horsepower, instant throttle response and a thick torque curve that jettisons you from corner to corner in a blink of an eye. All with great fuel economy and a reputation for bulletproof durability. All Yamaha pictures are kind of Yamaha HD motorcycles picture was taken, including motor fuel gauge, engine, engine mounts, tires, fuel tank, the car handles, lights and so on, 2016 Yamaha SRViper L-TX DX full-screen viewing,2016 Yamaha Motorcycles today Price: $11,900 .